On a cool February afternoon shaded by the lingering Morro Bay fog, almost 50 people and about four dogs gathered at Del Mar Park to play or watch pickleball. Pairs of pickleball players rotated onto three makeshift courts on what is usually a roller hockey and roller derby arena. A few newbies played on the adjacent basketball court. Collapsible canvas chairs lined the spaces between the courts, and after everyone warmed up and got a few games in, they welcomed their special guests. Daniel Moore, 25, the United States of America Pickleball Association (USAPA) 2014 national 19+ gold medalist, and Michael Stahl, 51, the 2014 50+ mixed doubles gold medalist, were passing through town and joined the Morro Bay Pickleball Club to give a demo. BACK AND FORTH: National Pickleball champions Daniel Moore and Michael Stahl visited Morro Bay to show off their skills and share a few new pointers with local players. Spectators peppered them with questions, looking to glean all the tips they could. Then, everyone began playing again, showing a wide range of skills and competitiveness. As they played, opponents bantered over the net. There was plenty of laughter. It didn’t take long to begin to understand why pickleball is the fastest growing sport in the country. “The real secret of it all is having fun,” said Robert Thomas, pickleball advocate and aficionado. Thomas and his wife, Kathy, Morro Bay’s designated USAPA ambassador, were among five people who began playing five months ago. Now, it’s normal to see 40 or 50 people show up. In recent years, the sport has spread rapidly. At the beginning of 2014, there were 330 places to play in the nation; at the end of the year, there were 1,000, according to Central Coast USAPA Ambassador James Warner. Thomas will tell you all the reasons why: It’s accessible, since paddles and balls are rather cheap; the sport is easy to pick up; as a non-impact sport, it’s a bit easier on the body than tennis; and it’s fun and social. The game is especially popular among seniors and retirees. 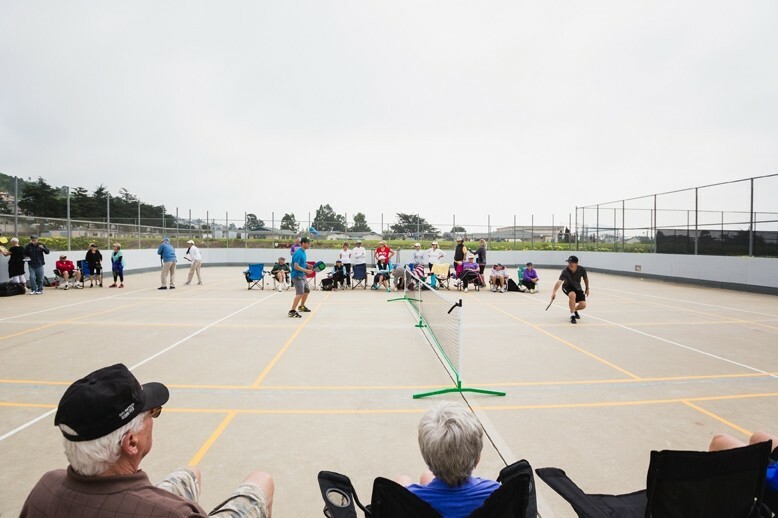 Pickleball is not all fun and games for some members of the Morro Bay community, however. With the sport’s rapid growth comes a common quandary: where to play. The suddenly ubiquitous activity is played on existing hard surfaces like basketball courts, tennis courts, or roller rinks, where different colored lines are added and portable nets are used. So far, only one set of permanent courts exists in the county after the Paso Robles Pickleball Club wholly funded the conversion of a rarely used roller hockey rink at the city’s Centennial Park. In Morro Bay, a once-mentioned idea of striping one of the two tennis courts at Monte Young Park caused a stir among tennis players and sent them on the defensive. Lynda Merrill, 75, a Morro Bay resident who’s played tennis since high school and is a member of the Surfside Tennis Club, said tension has developed between pickleball players and tennis players, caused partly by what she considers to be the incompatibility between the two games. “The pickleball players have kind of gotten the attitude that they can go ahead and take over the tennis courts,” she said. Even playing near a pickleball game makes Merrill cringe. Local tennis players showed up to a recent Morro Bay Recreation and Parks Commission meeting to voice their concern, joining a group of pickleball players who had been attending the monthly meetings. “They thought we were going to take over like a malignant tumor,” said Mollgaard, who attended the meeting, adding that one tennis player even broke down in tears. Thomas said that the pickleball players got the message, and are no longer considering striping courts at Monte Young. If there’s one thing to be said about pickleball players, they’re organized. They’ve been attending meetings and working with Morro Bay’s director of Recreation and Parks, Joseph Woods. In fact, when he talked to New Times for this story, he said he’d just gotten off the phone with a pickleball player. Woods is preparing an extensive staff report for a March 19 meeting at which the rec and parks commission will consider locations for permanent courts. “We want to make sure that all the possibilities are exhausted and discussed in public so we have the public process in play,” he said. Thomas, who’s advocating for an end goal of making Morro Bay a pickleball Mecca—which he claimed would be a boon to the city’s tourism industry—would ideally like to see 10 to 12 permanent courts constructed on a strip of field at Morro Bay Elementary School. That may be the most expensive of options, however, and it would need a go-ahead from the school district. Woods said he’s entertaining that idea as one option, but there are a lot of factors to consider. “We don’t want to overextend ourselves on a capital project that will never be able to be funded and never see the light of day,” Woods said. The discussion will likely hinge on whether to convert existing facilities to be multi-use, a common practice around the county, or to build single-use courts. Whether the tensions reach match point between tennis players and pickleball players—many of whom are current or former tennis players—is for time to tell. The tennis players may maintain their exclusive use of Monte Young, but like basketball and hockey players, there’s a chance they may have to learn to share. Pickleball ambassador Kathy Thomas seems to think it will work out. “People learn to deal with the different lines,” she said.